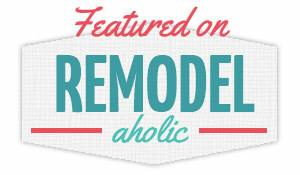 The Happy Homebodies: Entry Makeover, Chalkboard Front Door and Wisteria Mania! Entry Makeover, Chalkboard Front Door and Wisteria Mania! I woke up bright and early this past Saturday to be one of the first to arrive at the last day of the Wisteria Warehouse Sale. It was a major sale, and I had a blast checking out the goodies. I normally can't afford Wisteria stuff, but every item was at least 50% off at the sale. By the last day of the three-day sale, the prices were really, really low. It basically made me giddy with excitement to see so many gorgeous, unique pieces that were actually within my price range. I wasn't the only one feeling the shopper's high– I haven't seen that many excited shoppers since Black Friday! One of the first things I bought was this fabulous mirror for $75! It's selling on their website for $379 right now, so I scored a major bargain. It's huge and heavy and awesome. This mirror needed a place of honor in our house, and it ending up sparking an entryway mini-makeover. Step 1: Hang the mirror. The husband is very good at hanging heavy stuff, luckily for me. Step 2: Reupholster the bench. I've been carrying around this great fabric for a long time and was happy to finally use some of it! It looks so much better than the previous fabric. I've had this little bench a long time and used it to decorate my college house. 3. Paint the front door black. Well, what really happened was that we tried a Tiffany-blue color at first, but we both agreed we weren't feeling it. I decided to go dark and do the black color, and I love it. I am a big fan of how it draws your eye when you walk in the back door, which is the main entrance for us. And it's not just any black interior door– it's a chalkboard door! That's only the beginning of the doodles... I can picture snowflakes falling down the door, a cheery Christmas wreath, a welcome sign, stripes, polka dots, personal messages, Bible verses, the works! Have I told you how much I love the new mirror?! 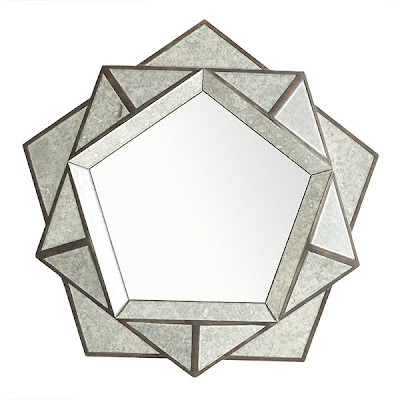 The angled mirror panes around the border reflect so many different surfaces and bring in more light to the space. I think it brings some glamor to our living room, which I love. Plus, it plays well with my sunburst mirror in the opposite corner. Even Scott thinks it is pretty cool and admitted that it was "a good purchase." YES! We got a few more treasures at the Wisteria Warehouse Sale, and I'll show you those tomorrow. Let's just say that it was a seriously fun shopping experience. Even my dad was getting into the treasure-hunting action! The Wisteria workers told me they have these sales twice a year, so I'm pledging to never miss another one. I am fortunate to live less than 10 minutes from the Wisteria warehouse, so these warehouse sales are basically right in my backyard.